This is a copy of the article "Yellow-legged gulls and yellow-legged Herring Gulls in the Baltic", by Lars Jonsson and published in Alula 3, 1998. "I" in the text refer to the author Jonsson. We also reproduced some tables and figures from this article, but also added many, many more images from especially ringed birds to illustrate Lars's article. We did our best to be very precise, but if you find any errors, please let me know at marsmuusse at gmail dot com. 1. michahellis from the southern Black Sea in the east and across the whole of the Mediterranean basin west to the Atlantic seaboard. Smaller colonies or individual pairs breed in central Europe and along the French Atlantic coast north to Amsterdam. 2. atlantis on Madeira, the Canary Islands and the Azores. Birds from the Azores seem to be the most distinct of the atlantis populations (see plate F), and the subspecies was first described from these islands (Dwight 1922). Birds breeding on the Atlantic coast of the Iberian Peninsula and Morocco stand morphologically closer to atlantis and are better treated as such. They may even qualify as a separate subspecies. These birds are smaller, darker and shorter-legged than typical michahellis from the Mediterranean basin. 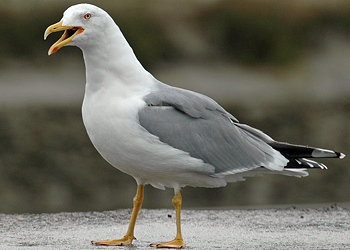 I will refer to all these forms as Yellow-legged Gull. Atlantic Yellow-legged atlantis 3cy, August 23 2010, São Miguel, Azores Islands (Richard Lowe). Note yellow iris and 3-toned bill. Heavy streaking on head. Yellow-legged michahellis sub-adult, October 01 2001, Le Portel, France (Mars Muusse). For west Med michahellis, the head streaking is well-developed especially in sub-adults like this bird; consisting of fine streaks that will easily wear of which will result in a rather white-headed appearance already early in winter. Atlantic Yellow-legged atlantis adult, September 17 2012, Povoacao, Azores Islands (Chris van Rijswijk). Note heavy head streaking and in this bird speckled iris. Yellow-legged michahellis adult, May 24 2011, Tel Aviv, Israel (Amir Ben Dov). Breeding michahellis in the East Mediterranean. Atlantic Yellow-legged atlantis 3cy, October 16 2012, Corvo, Azores Islands (Peter Alfrey). P9 almost equals P8 in length. P10 growing, with small mirror. Note head streaking. Yellow-legged michahellis adult, November 26 2006, Etaples, NW France (Mars Muusse). Full band on P10, black on P4. Only very fine streaking on head in winter. Atlantic Yellow-legged atlantis 3cy, August 23 2010, São Miguel, Azores Islands (Richard Lowe). Note pale eye in dark face, including chin. Yellow-legged michahellis adult, January 02 2011, Mamaia, Romania (Chris Gibbins).Pretty classic pattern for michahellis, with full bands on P10 and P5, and small mirror on P9. Pale tongues seem to been longer than in western Med. birds. 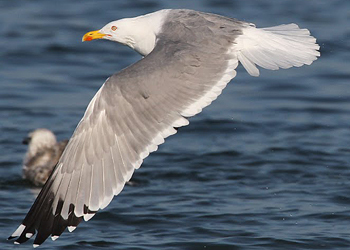 Structure: Throughout their entire range, from eastern Mediterranean and west to the Atlantic Islands Yellow-legged Gulls have a rather similar shape. 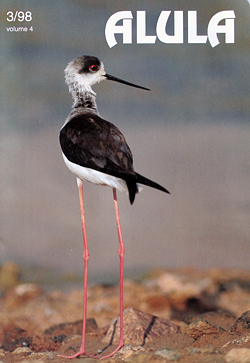 The largest and longest-legged individuals, found in southern France, are comparable in size to Baltic argentatus. 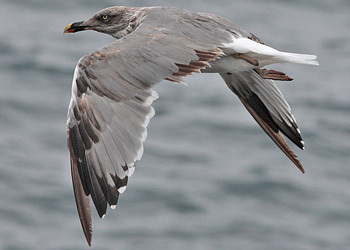 In general michahellis is somewhat smaller than Baltic argentatus. The smallest, darkest and shortest-billed birds occur on the Atlantic islands. Michahellis is more similar to argentatus than cachinnans in build but shares the longer legs and slimmer rare end with the latter. The head usually has an almost sculpted look with a domed forehead, a flat crown and a thick neck. The shape of the head is sometimes more rounded, bulbous and very similar to that of argentatus, but at other times it is distinctive. Especially long-billed individuals can have a rather drawn-out head with only a low bump at the forehead and a long, very flat crown sharply angled where it meets the nape (see fig. 26). The silhouette otherwise shows a full chest and a drawn-out and slim rear end. The wings in flight do not appear as long as on cachinnans and especially on juveniles the hand looks more pointed. The wing is, however, broader than that of graellsii. In flight the silhouette usually shows a more marked breast and a flatter belly than on cachinnans. 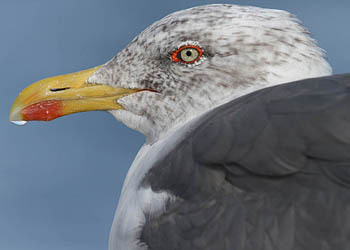 The bill is often very distinctive, looking powerful and sometimes almost Great Black-backed Gull-like due to a marked gonydeal angle, steeply curved nail and protruding nail-tip, as well as a somewhat bulging cutting-edge. There is, however, marked variation, so while the bill shape of half of the birds (males?) looks characteristic, that of the remainder (females?) can be less pronounced, and they may even appear small-billed. This is especially true of atlantis. One could say that in the field there seems to be a small overlap in the bill-shape between cachinnans and michahellis. When viewing large numbers of michahellis you should therefore expect to find a few which remind you of cachinnans (see fig. 29). The bill-shape is still a good clue, especially for young birds which often have a predominately black bill set against a pale forehead, emphasising the shape. Plumage: Within the whole michahellis-range the mantle shade varies between 6.0 and 7.0 on the Kodak Grey Scale. I have measured 23 individuals throughout the Mediterranean and I cannot see any clear pattern or cline. I have found birds clearly scoring 7.0 only in the easternmost part (in addition to one found dead in Hungary), and again within the range of atlantis, where birds normally are 7.0-7.5. The mean value for both the eastern and western birds was 6.3. The largest birds from the French Mediterranean coast should be somewhat paler than others (Schwelm, pers. comm.) but I have not examined any of them. 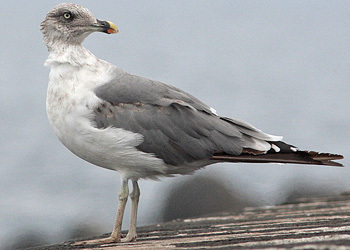 This means that both cachinnans and michahellis will fall within the variation of argentatus from the Baltic. The lack of a bluish tinge on michahellis is to my eye more obvious than on cachinnans, creating a somewhat steely or dull grey tone which at times stands out against the slightly paler blue-grey of Baltic argentatus. On average, the wingtip shows more black than on argentatus, and quite often P4 has some black, but the more common pattern is black restricted to the six primaries (P5-P10) for this form as well. The black on P5 is, however, more of a distinct black band (see plate C) and only very rarely limited to just a faint, very narrow or broken black band across the tip, as it is in most argentatus. A good distinction between michahellis and cachinnans is the pattern of P10, as illustrated on Plate C. The normal pattern of P10 on michahellis shows a grey inner wedge running no more than halfway out to the tip (from the tip of the longest primary covert). Some birds can have an almost white tongue extending outwards along three-quarters of the visible length the outermost primary, thus approaching the appearance of some argentatus and cachinnans (Kroneisl 1951 and pers. obs). This innerweb criterion will nonetheless separate the vast majority of michahellis from cachinnans. This character is usually easy to see in July-August when the gulls very frequently indulge in preening the moulting wing. The majority of michahellis have white mirrors on P10 and P9 but atlantis more commonly has only one white mirror. About 15% of michahellis from the eastern Mediterranean have a complete white tip to P10 but it is rarely as long as on typical cachinnans. ln winter plumage michahellis acquires fine streaks or a clouded area around the eye and over the crown (see plate F). 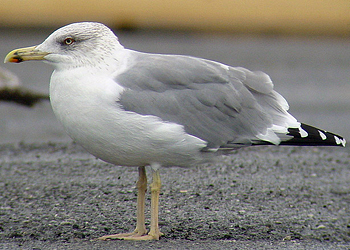 The extent of dark streaks varies individually but on average the head is whiter and less marked than on argentatus. Within the range of atlantis, especially pronounced on the Azores, adult birds can acquire a strikingly dark head in winter (see plate F), These birds look a bit odd in that they also have dark marks on the area below the gape but lack streaks on the neck. This well streaked head is clearly less pronounced in Moroccan birds, in addition to those on the Canary Islands. Some argentatus observed in the Baltic have very limited streaking on the head, but in general the michahellis among an autumn flock of argentatus will stand out as being comparatively white-headed. Garner (1997) stated that the dark streaking on adult michahellis is most prominent from late July to early November. In the final week of July in Hungary, no michahellis had yet developed a streaked head, so possibly these birds differ in timing compared with those of more westerly origin. Herring Gull argentatus adult, April 04 2014, Pori, Finland (Petteri Mäkelä). Yellow legs and red orbital ring like michahellis, but wingtip way too white: thayeri pattern on P10, large mirror on P9 merges with tip. Only thin black line on outerweb of P5. Yellow-legged michahellis adult, January 02 2011, Mamaia, Romania (Chris Gibbins). Short pale tongue on P10 (yet quite broad with angular ending) and full band on P10 and P5. Juveniles Young birds give a very variable field impression, some being dark and others very pale, including individuals which are very difficult to tell from argentatus. While juvenile cachinnans usually stand out as distinctive, I have on several occasions struggled to identify juvenile/first-winter michahellis candidates. In such cases the final decision had to be held over until the bird took flight, revealing the tail- and wing-patterns. On the whole juvenile michahellis shows more contrast than juvenile argentatus, being especially whiter and less marked on the throat, belly and vent. The mantle feathers, wing coverts and tertials show more strongly pigmented centres (darker brown) and neater pale edges than on argentatus. Roughly, they look like an argentatus with the plumage more of a fuscus. Most are reasonably easy to tell from juvenile cachinnans on structure alone, but the darker feather-centres, the difference in the tertial and greater covert pattern and the darker under-wing are useful confimatory characters. When fresh, the head shows very fine or soft streaks concentrated around the eye and the ear-coverts, sometimes appearing like a dark eye-mask. 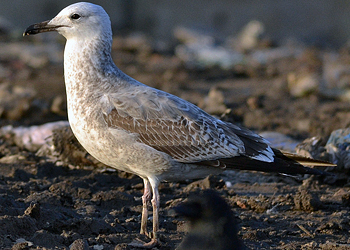 This dark mask (somewhat reminiscent of first-winter Mediterranean Gull) can be distinct and is accentuated by further abrasion and bleaching. The head becomes progressively whiter and especially the area around the base of the bill contrasts sharply with the black bill. 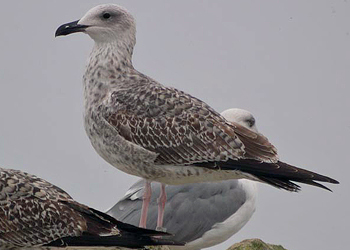 By late August-early September the moult into first-winter plumage is usually more advanced than it is in argentatus. The new winter feathers are on average more boldly patterned, with more transverse bars and larger blotches compared with cachinnans, but there is an extensive overlap. Compared with juvenile argentatus the wings are darker above, especially the innermost primaries (see plates E & H). The variation is, however, extensive in both species, and there is some overlap concerning this feature. Typically michahellis has darker and more simply patterned bases to the outer greater coverts compared with argentatus, creating a darker fuscus-like panel. The inner coverts are, however, usually clearly chequered or barred, so that the panel is restricted to the outer portion of the arm. The outer greater coverts are often solidly dark brown in the centre, with a whitish outer edge, giving rise to distinct stripes. Juvenile argentatus are usually barred all the way out on the greater coverts, the whole row of coverts being overall paler. Some darker morphs of argentatus can show a darker base to the outer coverts creating a darker panel but the pale margins to the coverts are usually broken up into smaller spots and vermiculation, as opposed to the unbroken, pale edge typical of michahellis. At the same time a few michahellis have a greater covert pattern which is more or less identical with that of typical argentatus (see also under cachinnans). There is also a clear average difference between michahellis and cachinnans in the impression of the underwing, the latter being paler and less strongly patterned. Michahellis is usually well marked and sometimes very dark on the underwing coverts. Argentatus is usually very diffusely patterned on the underwing coverts, at a distance the whole underwing is suffused brown, lacking contrast; argentatus, however, also varies in this respect and some are more striped on the underwing. Michahellis can have an underwing that shows little contrast over the coverts, but more typically one or two light stripes are formed by light bases to the coverts in the centre of the arm, giving the underwing a more patterned look. The lightest birds (only in eastern Europe?) overlap with darker cachinnans (see fig. 30). Some juvenile michahellis, and frequently atlantis, look almost solidly dark on the underwing coverts. 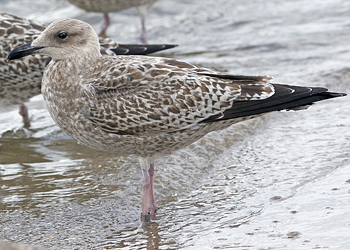 Compared with argentatus, the tail-base/upper tail-coverts usually appear white with fewer marks while the tail-band looks very black and distinct. In a classic michahellis the uppertail coverts are white with a single heart-shaped or triangular dark spot at the tip of each feather, forming a neat string of spots. However, the variation is marked and many are not at all conspicuous in this respect. In the field the white tips bordering the black tail-band attract attention in a way that is seldom matched by argentatus or cachinnans. 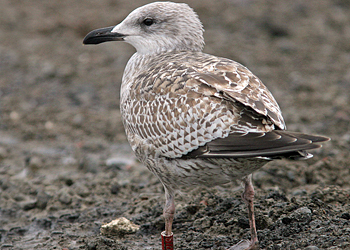 The variation in the overall impression of juvenile michahellis is bewildering and at times the identification versus argentatus and even so graellsii can be extremely difficult and should always be based on a combination of several supporting characters. In the Baltic juvenile fuscus is of course the most obvious confusion risk as well as visiting intermedius and graellsii. Most juvenile f. fuscus have a rather fine bill and very slim outline; when vacating the colonies in August, they look very neat and fresh compared with most michahellis. Normally thetail-band is much broader and the rump is also more intensively patterned. Although f. fuscus has comparatively short legs, I find this character, or the impression of it, very variable. Yellow-legged michahellis M-002563 1CY, October 06 2005, Chevroux, Switzerland (Stephane Aubry). Scapulars replaced; 2nd gen feathers with bold patterns / anchor shapes. Covert moult not finished. Strong bill, salmon pink legs, thin fringe on tertials. Caspian Gull cachinnans DN25340 1CY, October 20 2011, Minden, Germany (Armin Deutsch). From Poland, probably female. White headed and last replaced scpaulars plain grey with thin dark shaft. 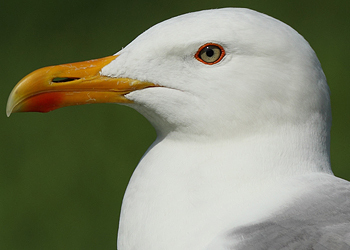 Tertials as in Common Gull. Parallel bill. Herring Gull argentatus C5Y8 1CY, October 30 2005, Tampere, Finland (Hannu Koskinen). Moult in the upper scapulars and few lower scapulars. Notched fringes on tertials. Piano-key pattern on greater coverts. Strong bill and streaked head by October. Herring Gull argenteus SR 1CY, September 17 2013, Katwijk, the Netherlands (Mars Muusse). From July onwards, juveniles replace the mantle and upper scapulars, moulted to second generation feathers, showing an anchor pattern and a dark base. The notched pattern of the juvenile scapulars is repeated on the juvenile coverts. The greater coverts show a 'piano-key' pattern; on the outer greater coverts as well. The tertials have an obvious notched pale fringe and transversal bar. Sub-adults Michahellis can appear in full first-winter plumage as early as the beginning of September (one individual seen on Gotland on l9th September had replaced all visible body feathers), thus substantially earlier than argentatus or fuscus. Some michahellis fledge in the latter part of May and begin to moult scapulars in July. The new winter scapulars are variable, showing the same general pattern with a dark anchor as on most forms within the complex. Some first-winter michahellis (possibly more pronounced in eastern Mediterranean) show a contrast between lighter scapulars and the darker brown wing coverts, not normally seen on argentatus. All the important distinguishing features on the wing and tail are retained during the first winter, but usually michahellis will renew some or several wing coverts. This in itself is an important fieldmark when separating it from argentatus. 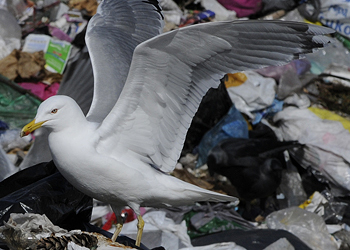 A large gull which has replaced some wing coverts before April of its second calendar-year is, as a rule, not a L. argentatus. I have seen only one first-winter argentatus which had shed innermost coverts (only one on each side) in mid-winter. 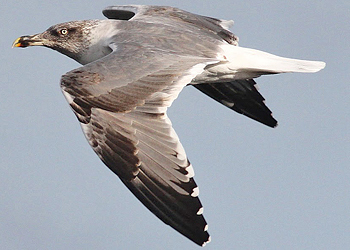 78% of all first-winter michahellis (n=42) examined in Marbella (southern Spain) in February had included some wing coverts in the partial post juvenile moult; the proportion may differ geographically. The head is usually at its lightest stage in August-September due to abraded and bleached juvenile feathers; in first-winter plumage the head and neck is typically well streaked apart from the forehead which usually remains whiter, accentuating the black bill. Michahellis in this plumage can, however, be very hard to tell from first-winter graellsii. This problem is most acute in late autumn and winter in western and south-western Europe where graellsii, michahellis and atlantis can be expected to occur side-by-side. Apart from the structural differences (graellsii having a less blunt-tipped bill and shorter legs), a juvenile graellsii in August-October in the Baltic would most likely be fresher with an overall browner and more saturated plumage, have a more coarsely streaked head and belly and more strongly patterned rump and tail-base. 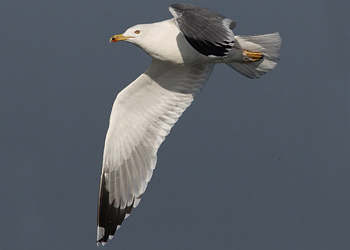 It should always be kept in mind that intermedius, and to a lesser extent graellsii, do indeed regularly occur in the Baltic; based on personal observations on Gotland, these are mostly sub-adults and adults. My own experience from Gotland includes around five 1cy michahellis (August-September) but in none of these cases was intermedius/graellsii suspected. Furthermore juvenile graellsii rarely or never moults wing coverts before November. Atlantis in first-winter plumage can be very strongly patterned, including head and belly/vent and thus well matching many argentatus. Herring Gull (argenteus) 5CY VPA May 18 2013, Calais, NW France. Picture: Jean-Michel Sauvage. Herring Gull (argenteus) CFAR 4CY (3rd cycle), May 15-28 2011, Oostende, Belgium. Picture: Peter Adriaens. Herring Gull (argenteus) CJAV 4CY (3rd cycle), May 22 2011, Oostende, Belgium. Picture: Peter Adriaens. Herring Gull (argenteus) CRAB 2CY & 4CY, August 2009 & May 2011, Westkapelle & Oostende. Picture: Theo Muusse & Peter Adriaens. Herring Gull (argenteus) CRAC 4CY-5CY (3rd - 4th cycle), May 2011 - Frbruary 2012, Koksijde, Belgium. Picture: Peter Adriaens. Herring Gull (argenteus) CRAN 4CY (3rd cycle), May 22 2011, Oostende, Belgium. Picture: Peter Adriaens. Herring Gull (argenteus) MTAB 4CY (3rd cycle), May 01 2012, Koksijde, Belgium. Picture: Peter Adriaens. Herring Gull argenteus BLB H-905586 4CY, May 24 2016, Katwijk aan Zee, the Netherlands. Herring Gull H-112084 4cy (argenteus), May 03 2003, Voorhaven, Zeebrugge, Belgium (51.59N 04.02E). Herring Gull Y.AFC 4cy (argenteus), May 06 2011, IJmuiden, the Netherlands. Also photographed as juvenile. Herring Gull (argenteus) K.AZV 1CY-5CY, November 2013 - May 2017, the Netherlands. Herring Gull (argenteus) K.BKX 2CY & 4CY, May 2015 & May 2017, Den Helder & Hoornderslag - Texel, the Netherlands. Herring Gull 13 5-6cy (argenteus), 05 May 2005 & 09 May 2006. Breeding bird at Moerdijk, Netherlands. Herring Gull 6T 4-5cy male (argenteus), 21 May 2005 & 09 May 2006. Breeding bird at Moerdijk, Netherlands. Herring Gull E4 4cy male (argenteus), 02 May 2006. Breeding bird at Moerdijk, Netherlands. Herring Gull HK 5cy female (argenteus), 04 May 2006. Breeding bird at Moerdijk, Netherlands. Herring Gull HT 5cy male (argenteus), 05 May 2006. Breeding bird at Moerdijk, Netherlands. Herring Gull J2 5cy male (argenteus), 05 May 2006. Breeding bird at Moerdijk, Netherlands. Herring Gull NU 5cy male (argenteus), 23 May 2006. Breeding bird at Moerdijk, Netherlands. Herring Gull argenteus 1Z sub-adult (5CY), May 2014, Maasvlakte, the Netherlands. Picture: Merijn Loeve. Herring Gull argentatus J5086 4CY, May 08 2015, Vest-Agder, Norway. Picture: Nils Helge Lorentzen. Herring Gull argentatus J5182 4CY, May 24 2015, Vest-Agder, Norway. Picture: Nils Helge Lorentzen. Herring Gull 4CY, May 24 2016, Katwijk, the Netherlands. Herring Gull (argenteus) 4CY, May 27 2015, IJmuiden, the Netherlands (52.27N-04.33E). Herring Gull (argenteus) sub-adult, May 27 2015, IJmuiden, the Netherlands (52.27N-04.33E). Herring Gull sub-adult, May 13 2014, Katwijk, the Netherlands. Herring Gull sub-adult, May 20 2014, Katwijk, the Netherlands. Herring Gull 4cy, May 05 2013, Brouwersdam, the Netherlands. Herring Gull 5cy, May 05 2013, Brouwersdam, the Netherlands. Herring Gull sub-adult, May 22 2014, Katwijk, the Netherlands. Herring Gull 4cy (argenteus), May 02 2012, Maasvlakte, the Netherlands. Herring Gull sub-adult (argenteus), May 31 2002, EMO - Maasvlakte, the Netherlands (51.59N,04.02E). A clear sub-adult bird, nonetheless with a nest and two relatively large chicks. Compared to the surrounding Lesser Black-backed Gulls, this brood is doing well.